Product prices and availability are accurate as of 2019-04-21 06:21:02 BST and are subject to change. Any price and availability information displayed on http://www.amazon.com/ at the time of purchase will apply to the purchase of this product. A comfortable alternative to traditional earphones. The DJ Pro 3000 STK "stick"-design headset is a hand-held single-cup headset screen for professional DJs that embraces its performance from Stanton's top-of-the-line DJ Pro 3000 earphones. 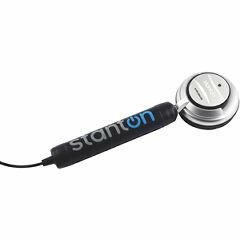 The single-cup stick headset has actually been a favorite of house and other DJs for several years, however this is the very first one to provide Stanton's finest headset technology and attractive industrial design. The DJ Pro 3000 STK pumps out optimal output with a 50mm Neodymium motorist for exceptional monitoring even in high-volume environments and includes a captivating blue LED on the side of the cup that flashes to the beat. Consists of a hassle-free carry pouch for safe and easy transportation.